The InstallShield 2008, 2009, 2010 & 2011 action allows you to build InstallShield 2008, 2009, 2010 & 2011 projects. The options on these property pages are the same as for the InstallShield Developer action. See the linked help topic for details. The options on this property page are unique to InstallShield 2008, 2009, 2010 & 2011. 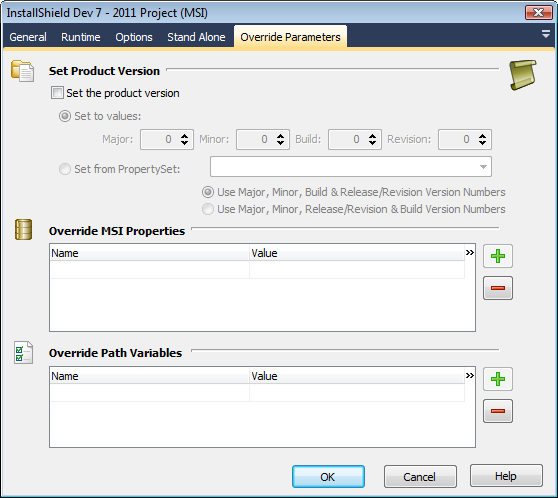 This overrides the product version set in the .ISM project file with an explicit product version. This is equivalent to the -y command line option. InstallShield 2010/2011 also allows you to specify the 'Revision' version number, this option is not available for 2008/2009. Set the product version via numeric values, or by specifying a PropertySet. This option allows you to override any MSI Property. If the property does not exist in the project, it will be created. This is equivalent to the -z command line option. Type property names and values into the blank row of the grid. To remove an entry, clear the name and value fields.